The Albuquerque Isotopes have released the preliminary home schedule for the 2019 season. The Isotopes' 140-game campaign will commence with Opening Night on Thursday, April 4 against the Salt Lake Bees as part of a five-game opening series at Isotopes Park. Highlights of the home schedule include 33 weekend dates, including each month featuring at least two weekend series, and home games on Easter Sunday (April 21 vs. Tacoma), Memorial Day (May 27 vs. Sacramento), Father's Day (June 16 vs. New Orleans) and Independence Day (July 4 vs. Las Vegas). The season will feature 18 series over 12 homestands. 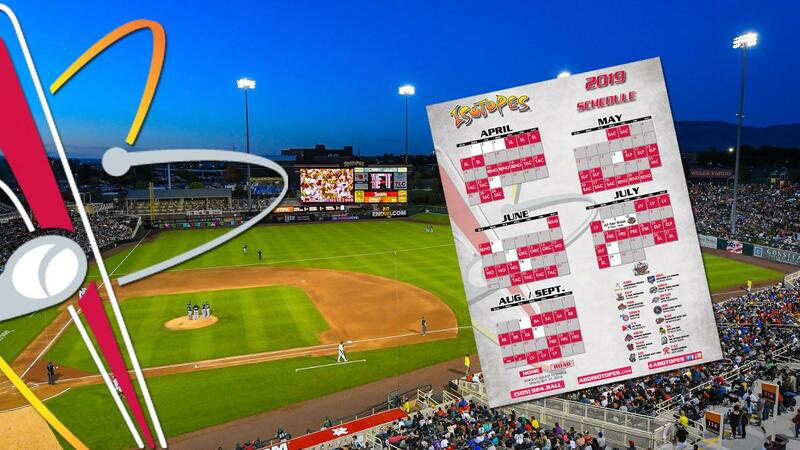 In 2019, more than half of the Isotopes home games will take place after the school year has ended and prior to the start of the following school year. "We've already got some great things in store for the 2019 season," said Isotopes General Manager John Traub. "April 4 can't get here soon enough!" Albuquerque's 17th home season concludes on Thursday, Aug. 29 vs. Las Vegas. The 2019 season will mark the first time the Isotopes welcome the newest Pacific Coast League franchise, the San Antonio Missions, to Isotopes Park. The Missions will be affiliated with the Milwaukee Brewers and replace the Colorado Springs Sky Sox in the league. Other new affiliation changes include Las Vegas partnering with the Oakland Athletics, Round Rock with the Houston Astros and Nashville with the Texas Rangers. The Washington Nationals will re-join the PCL in 2019, affiliating with the Fresno Grizzlies. The Isotopes full schedule, as well as game times, will be announced at a later date.